Building Time at Brushy, by Stonney Ray Lane, 2003. The author was the warden of Brushy Mountain State Penitentiary when James Earl Ray escaped in 1977, and he tells the story of Ray's escape and capture, as well as the story of the author's life growing up and living in rural Kentucky and Tennessee. The autobiography covers Stonney Ray Lane's life, from birth in 1937 in Kentucky, through his retirement from prisons (and return to schools) in about 1979. 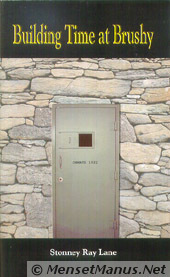 Approximately the middle third of the book covers James Earl Ray's escape, capture, and subsequent trial. I enjoyed reading the book, and I recommend it, not only for the history involving James Earl Ray, but also for the insights into life and violence in prisons, education inside and outside of prisons, life and violence in coal country, and for the descriptions of some local sites around Knoxville, Tennessee. How could one not like a book that adds favorably to the legend of places like Big Ed's Pizza Parlor in Oak Ridge, Tennessee? The book has a few rough edges. It has very little apparent structure or organization. Although the story-telling is easy enough to read, there are only four separate sections in the book, and only three sections are titled. For someone who is primarily interested in the portions about Ray's escape, it may seem to take a long time to get to that part. The book also has no table of contents, and no index. The bulk of the book is in one very long, unbroken, autobiographical narrative (271 pages in the paperback). This lack of structure makes it somewhat difficult to stay with the book at times. I noted a few typos, including "English" spelled as "Egnlish" in the Foreward, ironically in the section where Lane describes how he copied and cheated his way through college English. "This book is a work of fiction. Places, events, and situations in this book are purely fictional. Any resemblance to actual persons, living or dead, is coincidental." "The publishers have classified this book as "fiction" because I had to change some of the names of the inmates. But this story is the truth as I remember it. It is not a made up story; it really happened, as strange as it may seem. It is humbly dedicated to my children Lisa, Dusty, and Lori." There are a few surprises in the book. Lane says as a teenager he "had a few brushes with the law, a few automobile accidents," and he was sent by his mother to boarding school "for troubled kids from broken homes." He admits to cheating and copying to get through college English. Yet, he became a teacher at Coalfield school, was a teacher and counselor at Brushy Mountain Prison, and eventually became a principal at Wartburg Central High School. He says it is only "a thin line that separates a free man from one behind bars," and basically says "if it were not for getting the right break here and there, who knows?" he could have ended up on the other side of those bars. Later, he acknowledges that by working at the prison, he was also "building time" similar to the prisoners. Lane also wrote some surprising things about whether James Earl Ray was involved in a conspiracy to assassinate Martin Luther King, based on Lane's personal discussion with Ray. I don't want to spoil the story, so I won't say any more about that. Although the last section of the book only includes a short, two page description of Nub, and does not mention Nub's death, it does include the following statement, "As I said before, Nub Haynes was one of the most special people that you'll ever meet anywhere." It almost seems as though the book is being partly dedicated to Nub, and if the following obituary found online is accurate, this is understandable. The book is available in hardback, paperback, or PDF download. The Books a Million "Club" had the best price I could find for the paperback. Stonney Lane organized a Brushy Mountain Penitentiary employees reunion in 2001. Tennessee State Governor Bredesen recently announced a new Prison will be built in Morgan County, and Brushy Mountain Prison will be closed. Brushy Mountain Prison has a museum with confiscated contraband on display. The book was briefly mentioned at the end of Sam Venable's October 17, 2003 column. The official on-line TVA summary version of its own history (TVA site), or here (TVA site) for more details. Circling Windrock Mountain : 200 Years in Appalachia, (Now in Paperback) by Augusta "Jimmie" Grove Bell: Oak Ridger Newspaper 3/1/99 article, 11/19/98 article, also available from University of Tennessee Press. As the title suggests, this book is about the history of the area surrounding Windrock Mountain, Tennessee, beginning with the earliest non-native settlers in the late 1700's. For the most part, the book is structured like a tour of the main route around the mountain. The book is partly based on a series of articles by the author when she was a writer for the Oak Ridger Newspaper until 1970. Her original contribution is documenting her interviews of, and tours with, descendents of early settlers. She also presents information from older newspaper articles and other sources, and the old pictures included in the book are a treat. The book is good reading for someone who is interested in the history of this relatively remote area. The area is only a short distance from Oak Ridge, the Atomic City. It previously supported thousands of farmers and coal miners and their families, and is now home to three 200+ feet tall TVA windmills on Buffalo Mountain (next to Windrock Mountain). The Author, Augusta Grove Bell, died in March 2003. The Oak Ridger published two articles (5/5/2003, 5/8/2003). Tennessee's Coal Creek War : Another Fight for Freedom, by Chris Cawood, Gaynell Seale (Editor). This book is about Tennesseean's war for their jobs in the Anderson County mining region around 1891-1892. It is an historical novel. It tells an interesting fictional story based on factual events during the war between free miners and coal companies supported by the State of Tennessee Militia. The miners wanted to enforce the new state laws giving them the right to have a miner check-weigh the coal they produced, and to be paid their wages in US Dollars rather than in company scrip. The coal companies tried to get the miners to waive their rights. When the miners refused, the companies expanded the use of convict laborers, including ex-slaves, who were leased from the state. The miners took up arms to fight for their rights and against what they saw as a threat to their families' lives (or life, liberty and pursuit of happiness). The state abolished the prison labor leasing system in 1893, and Brushy Mountain State Prison (Correctional Complex) was opened in 1896 on the northwest side of this area, in Petros, TN. [Here is a picture of the prison entrance.] The private mines returned to using free miners, and the prison then used convict labor in a State mine near the prison. Remnants of this prison mining activity, now overgrown, can still be seen by taking a short walk up a dirt road from Armes Gap, and the Cable from the prison to mine is still shown on topographic maps. Some private mining still goes on in the area. Night Comes to the Cumberlands : A Biography of a Depressed Area by Harry M. Caudill (see also this and this [local copy]). This book is referenced in Bell's Circling Windrock Mountain (above). Taking a quote from the book, it could well have been subtitled: From 'Root Hog or Die' to 'Can You Spare a Dollar, Please.' Although it traces the history primarily of the Eastern Kentucky Cumberland Plateau area, there are probably some similarities with the character of life in similar mountain country in parts of West Virginia, Virginia, and Tennessee. While it describes the history from the time of the first non-native settlers until about 1963, the book is essentially a plea for outside help for the area. The author suggests the formation of a Southern Mountain Authority to be much like the Tennessee Valley Authority. He states "The T.V.A. demonstrated the means by which many of the world's trouble spots can be rescued. It's example now offers solid assurance that, for low direct cost to the taxpayers, America can successfully attack the ills of the Southern highlands in a campaign that will eventually benefit every one of the fifty states." He does not let TVA off without criticism, though, because he blames TVA for much of the motivations that lead to increased strip mining rather than deep mining. He claims that in 1953 TVA began changing from a "benevolent government agency whose masters gave every evidence of a wise dedication to public service" into "a mammoth corporation which subordinated all other considerations to low costs and balanced budgets." Other than the concluding plea for help, the book is depressing, and offers little hope. It traces the history from fiercely independent settlers, through company coal towns, to a severely depressed welfare state with poor schools, which threaten to perpetuate the problems indefinitely. Despite the depressing aspects, the history is well written and interesting. In predicting the continued decline of the coal industry, the author does reasonably well, but does not foresee the formation of an organization like OPEC, and he makes an interesting, perhaps over-confident comment about nuclear power. He says, "The growing petroleum glut and the network of natural gas pipelines lessen coal's importance with each passing season. Within a few years tireless atomic reactors will provide much of the electric power now made from coal."